Anyone who has seen the moving film Visages Villages by director Agnès Varda and photographer JR was probably especially touched, as I was, by the sweet-natured and talented JR. This young (now 35) Frenchman became famous for his guerrilla wheatpasting of gigantic posters of his photos of people in unusual locations like the facades of buildings or on trains or even ships. 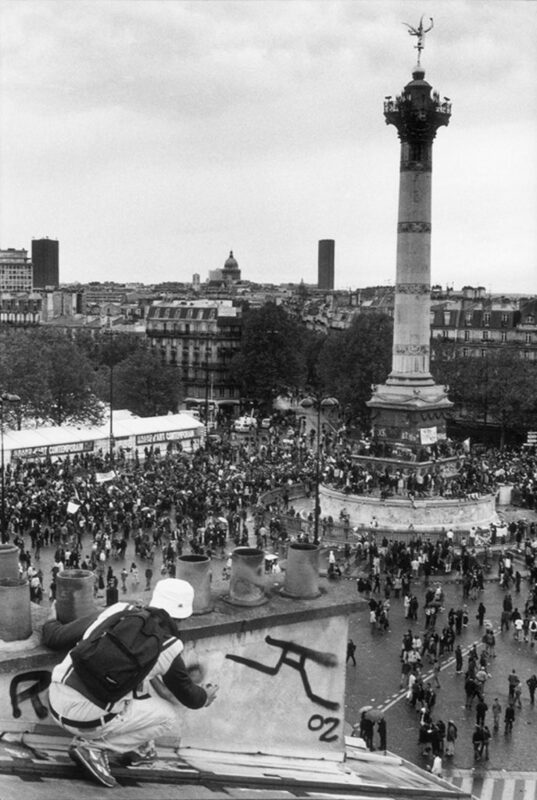 Now his work, which always has a subtle political or social message, has moved from the streets to the museum with a solo show, “JR: Momentum,” at the Maison de Photographie Européenne in Paris. Like street artist Banksy, JR (for Jean-René) keeps his identity a secret, but his face is certainly known to the public, always slightly disguised by sunglasses (which Varda begs him to take off in the film so she can see his eyes), a beard and a hat. He developed his photo skills and combined them with the outlaw spirit of the graffiti artist, creating a variety of clever projects. 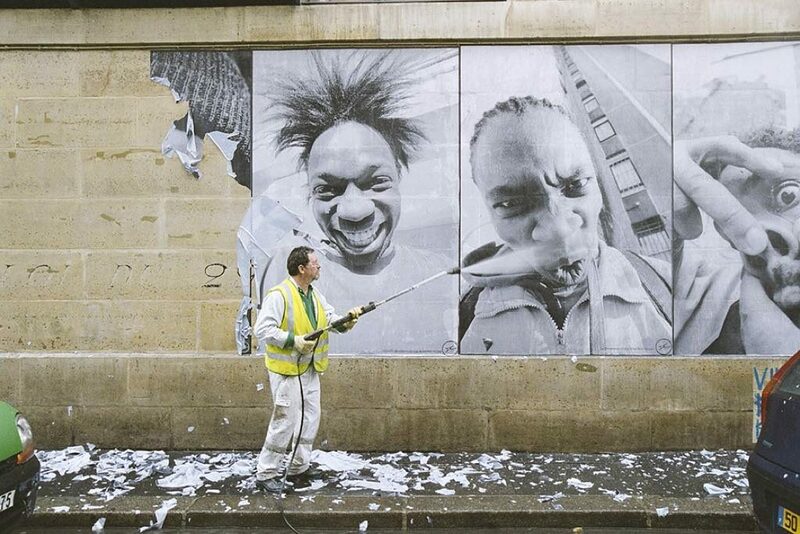 “Portraits of a Generation,” with collaborator Ladj Ly, for example, began in 2004 with blown-up images of the distorted faces of young suburbanites illegally plastered over the walls of the Clichy-Montfermeil suburb (where JR grew up), but took on new urgency after riots erupted in neglected Paris suburbs in 2005 after the killing of two young people by the police in another suburb. For his project “Women Are Heroes,” JR photographed women all over the world and pasted their images on walls and trains. The project culminated with “Eyes on Boat,” for which an image of the eyes of a woman from a Kenyan slum was blown up, cut up and pasted on 180 shipping containers. 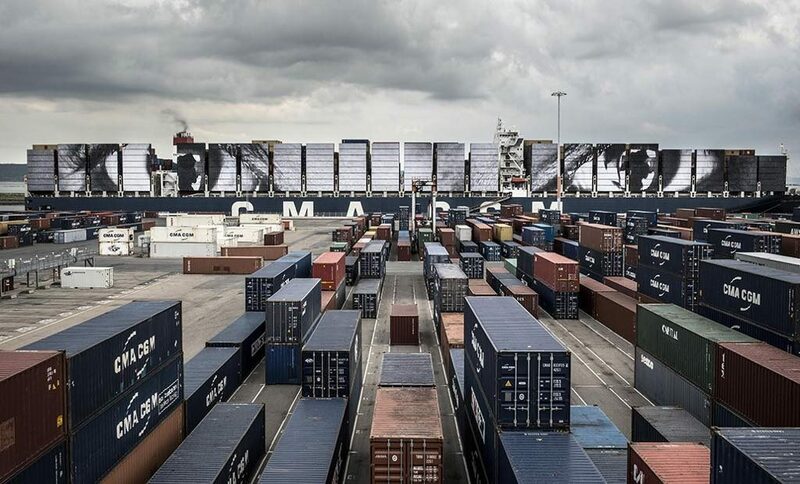 Once the containers were loaded in the right order on the ship, with the help of dock workers, the image came together like a puzzle and traveled around the world. The show includes a mechanized model of the ship. 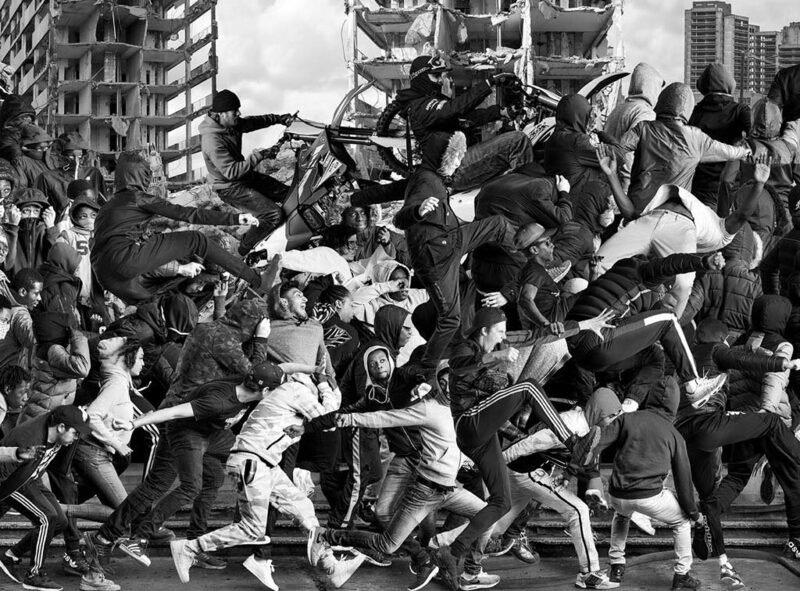 In 2017, JR and Ladj Ly photographed 750 more people in Clichy-Montfermeil and combined their images into a gigantic mural (part of it pictured at the top of this page). Presented in a lightbox in the exhibition, this piece itself is worth the price of admission to the show. It creates a kind of black-and-white frieze that refers to Delacroix’s painting “Liberty Leading the People,” commemorating the French Revolution of 1830, with a woman on high rallying the crowd to action with an outstretched arm. The quality and size of the fascinating image ensure that each face is individualized in spite of the number of people shown. A recent project brings technology into play to give a voice to 245 individuals, each with a strong position on the issue of firearms, all collaged together in a video mural, “The Gun Chronicles: A Story of America,” which appeared on the cover of Time magazine on November 5. When the mural is viewed on its webpage or on the free JR smartphone app, clicking on the image of an individual brings up an audio interview with him or her. An American flag waves at the top of the animated image, while seven people in a row on the bottom right aim their weapons, and on the bottom left victims of gun violence light memorial candles. In the center, politicians waffle about the issue and militants harangue. The cool thing about JR is that he cares about political and social issues and comes up with inventive ways to get his message out in a way that rings out loud and clear, always raising a smile. Open Wednesday-Saturday, 11am-8pm. Closed Monday and Tuesday.